This is the best compact crossover for you if you believe Chevy has finally gotten it right. All-new for model-year ’18, the third-generation Equinox sheds unnecessary inches, unwanted pounds, and its available V-6 engine. It gains safety features and a trio of turbocharged four-cylinders engines – including a diesel. It looks fresh inside and out and boasts ride and handling honed in Europe. The redesign brings this five-seater into the compact-crossover mainstream. It has more passenger room than its bulkier 2010-2017 predecessor but is resized to better compete with leading rivals like the Honda CR-V, Toyota RAV4, and Nissan Rogue. Unfortunately, it’s also priced near the top of the class. And only the most expensive version is available with safety features that are standard on less costly rivals. Should you buy a 2018 model or wait for the ‘19? 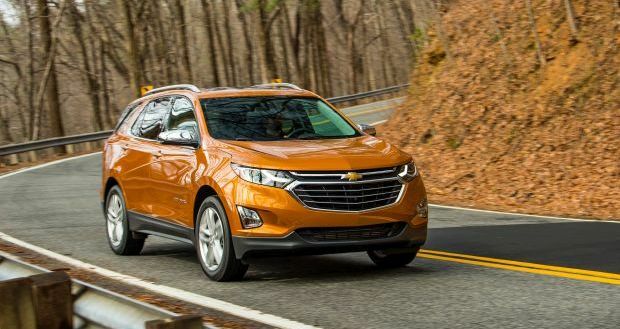 Hold out if you think Chevy might make key safety items, such as autonomous emergency braking, available on more than just Equinox’s flagship Premier model. Otherwise, you’ll not gain much by waiting for the ’19. It’ll be a virtual rerun of the all-new ’18 Equinox but will almost certainly cost more. Same goes for the GMC Terrain, the slightly fancier Equinox cousin from corporate parent, General Motors. Similarly downsized for model-year 2018, Terrain shares the Chevy’s basic design and powertrains, but has different styling. Buying a 2018 Equinox introduces you to Chevy’s latest thinking about the ideal young-family crossover. Even the entry-level model comes with keyless entry and pushbutton start, alloy wheels, and WiFi hotspot capability. The broad lineup starts with the L model and ascends through LS, LT and Premier trims. The L is front-wheel drive only; the others are available with Chevy’s innovative Switchable All-Wheel Drive intended to save fuel by allowing the driver to choose when to engage AWD. Styling: We’d argue its body-side scallops are fussy, but won’t debate the 2018 sheetmetal is a graceful advance over the chunkier previous generation. Also undisputed is the significance of the all-new understructure. 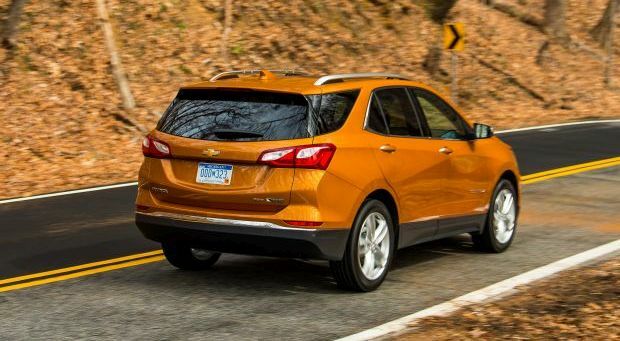 It’s noticeably more rigid and contributes to a roughly 350-pound weight reduction compared with the outgoing Equinox. Wheelbase – the distance between front and rear axles – and overall length decrease some 5 inches for 2018, yet passenger space actually increases. 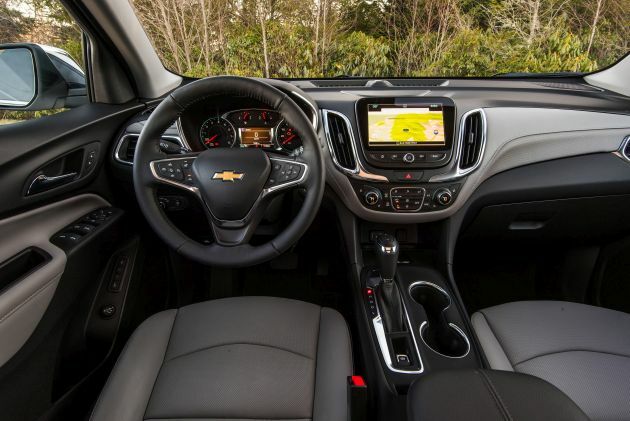 Chevy expands what already was generous back-seat room to near segment-leading spaciousness. The cushion is elevated and supportive, the seatback reclines, and we endorse the cost and weight saved by eliminating the bench’s ability to slide fore and aft. Yes, that sacrifices some cargo volume, which shrinks to slightly below class average. But it’s a small price to pay considering the benefits of this redesigned crossover’s smart new overall proportions, which visually underscore its more confident road manners. The new interior design follows Chevy’s latest practice, with organic shapes, easy-to-read gauges, and self-evident controls of generous size. The parking brake control is a modern console toggle. Centered high on the dashboard is the infotainment touchscreen and below it the main audio controls. Their positioning invites easy use by the front passenger but forces a stretch for the driver, who’s evidently expected to rely on redundant steering-wheel controls and voice commands. Leather upholstery, available in attractive two-tone themes, is exclusive to the Premier, where it’s standard. Other models have cloth. Most interior surfaces you’ll touch frequently are padded, but the general grade of cabin materials is unimpressive below the LT trim level. All ’18 Equinoxes, however, enjoy exceptional insulation from road and wind noise, making these among the quietest compact crossovers. Mechanical: Adopting an all-four-cylinder-engine lineup accentuates Equinox’s march toward the compact-crossover mainstream. Departure of the available 3.6-liter V-6, which had 301 horsepower and 272 pound-feet of torque, leaves the Jeep Cherokee and Mitsubishi Outlander as the segment’s sole six-cylinder survivors. Gone, too, is the base 2.4-liter four-cylinder of 182 horsepower and 172 pound-feet of torque. It’s replaced by a turbocharged 1.5-liter four with 170 and 203, respectively. The 1.5 is standard for all ’18 Equinox trim levels. Available in LT and Premier grades are two other turbo fours: a 2.0-liter with 252 horsepower and 260 pound-feet of torque, and a 1.6-liter diesel with 137 and 240, respectively. The 2.0-liter links to a 9-speed automatic transmission, the other engines to a 6-speed automatic. Only 1.5-liter versions were available for testing in time for this review – and we’d advise sampling the other engines before settling for this one. It feels coarse when you apply anything more than gentle throttle, which you’ll do frequently to summon any semblance of lively acceleration. Its accomplice is the slow-to-downshift 6-speed automatic transmission, which offers little assistance by way of the awkward knob-top button intended to replicate manual-gear control. The 2.0-liter/9-speed combo promises far better performance, with the turbodiesel an interesting alternative that, along with the Terrain version, is a class exclusive – pending EPA approval of the diesel Jeep Cherokee. Further testament to Equinox’s fine new understructure is the crossover’s impressive ride and handling. Tuned with input from engineers at Opel – the German brand owned until recently by GM – the suspension works with the rigid platform to deliver a satisfying blend of suppleness and control. Reactions to steering inputs aren’t as immediate as in a CR-V or Mazda CX-5, but the feel is laudably natural and linear. And if the new Equinox can’t quite match those class pacesetters for overall agility, it does handle with a fuss-free directness that inspires confidence. Tire and wheel sizes range from 17-inch diameter as standard on L, LS, and LT, to 18s and 19s available on LS and Premier models. Features: Standard features new to the Equinox include GM’s Rear-Seat Reminder that alerts you to check for left-behind items – or people – when you leave the vehicle. Also included on every model is Chevy’s Teen Driver monitor that tattle tails about activated safety systems and mutes the radio if seatbelts aren’t buckled. All models also come with a rearview camera; optional on the Premier is bird’s-eye-view surround-vision. The ’18 redesign introduces several driver assists previously unavailable on the Equinox – but virtually all are limited to the LT and Premier grades. Blind-spot detection with rear cross-traffic alert is standard on Premier and included in the LT’s $1,945 Confidence and Convenience Package. Other key safety items are exclusive to the Premier, as part of its $1,895 Confidence & Convenience II Package. These include lane-maintaining automatic steering correction and autonomous emergency braking that works below 50 mph to automatically bring the Equinox to a stop to avoid a frontal collision. Autonomous emergency braking is a prerequisite for coveted Top Safety Pick+ status from the Insurance Institute for Highway Safety and some competitors make it available on more than just their top-line models. It’s standard on every RAV4, for example, and on all but the entry-level CR-V. Otherwise, Chevy does a good job equipping the ’18 Equinox to satisfy a wide audience. All grades come with LED daytime running lamps, power heated mirrors, active noise cancellation, and GM’s useful OnStar system that can provide turn-by-turn navigation via the audio system. Also standard is Chevy MyLink Radio with Android Auto and Apple CarPlay compatibility. Imbedded navigation is exclusive to the Premier model as part of its $3,320 Sun, Sound & Navigation Package, an option that also includes a panoramic moonroof, a Bose-audio upgrade, and 19-inch wheels. Base prices for the 2018 Equinox are competitive with those of most rivals, although equipping the Chevy similarly to some compact-crossover alternatives can make it among the most expensive vehicles in the class. Base prices here include Chevrolet’s $945 destination fee. And you’ll need to add $1,750 to equip an LS, LT, or Premier with AWD. Prices for versions with the diesel engine were not released in time for this review, but a $2,500 premium would not surprise us. The ’18 Equinox L starts at $24,525, the LS at $26,455. The LS adds to the L a compass, but its main attribute is that it’s available with AWD. With the base 1.5-liter engine, the LT starts at $27,695 and the Premier at $31,735. With the 2.0-liter engine, the LT is priced from $30,090, the Premier from $34,530. Aside from engine choice, the LT builds on the LS with such standard features as xenon headlamps, a power driver’s seat with power lumbar support, and deep-tinted rear glass. To that, the Premier adds such standard items as LED headlamps, heated front seats with driver memory, dual-zone automatic air conditioning, and a hands-free power liftgate. In addition to its aforementioned features, the LT’s Confidence and Convenience Package includes remote engine start, mirrors with integrated turn signals, dual-zone climate control, heated front seats, a leather-wrapped steering wheel, and a power liftgate without hands-free operation. The LT’s $1,995 Sun & Infotainment Package contains a power moonroof, enhanced multi-colored driver information display, a 120-volt power outlet, and increases the number of USB ports from one to six. The Premier comes standard with most of that, including remote start and the turn-signal mirrors. In addition to the content note earlier, its Confidence & Convenience II Package includes the surround vision, cooled front seats, a heated steering wheel, , heated outboard rear seats, and GM’s IntelliBeam headlights that automatically switch between highbeam and lowbeam. Most Equinox buyers are likely to choose an AWD LT, and those that wisely opt for the 2.0-liter engine and indulge in the two main option packages will look at a sticker price of $37,675. That’s a reasonable value, given the powertrain specs. But if you want an AWD Equinox with the 2.0, plus leather upholstery and the latest safety features, you’re facing a retail bottom line of $43,390. That scratch gets you into any number of larger, midsize crossovers, including a nicely equipped version of Chevy’s seven-passenger Traverse. It also elevates you to premium-compact-crossover territory, where the Acura RDX, BMW X3, even the Mercedes-Benz GLC are attainable for under $44,000. An upside to the tepid acceleration of a 2018 Equinox with the 1.5-liter engine are fuel-economy ratings near the top of the compact-crossover class. The EPA rates it at 26/32/28 mpg city/highway/combined with front-drive and 24/30/26 mpg with AWD. With the 2.0-liter, ratings are also among the very best for compact crossovers of similar power, at 22/29/25 mpg with front-drive and 22/28/24 with AWD. EPA ratings for the turbodiesel were not released in time for this review, but GMC says a 2018 Terrain with the engine is expected to rate 40 mpg in highway driving. The 2018 Equinox went on sale in May 2017 with the 1.5-liter engine. The 2.0-liter turbo and diesel engines will become available later in 2017. The Equinox is better than the …. Toyota RAV4, whose safety-feature advantages are offset by underperforming powertrains; Nissan Rogue, also hampered by weakling acceleration, exacerbated by woeful handling; Jeep Cherokee, which is the class-leader off-road, but requires the V-6 to perform well on it. Honda CR-V, recently redesigned and the segment’s overall champ for roominess and road manners; Mazda CX-5, just one available engine and a little light on features, but equals the CR-V for driving fun and beats any rival for styling; Kia Sportage, a surprisingly solid performer at attractive prices, despite some strange styling elements. More competition. Get ready for fully redesigned 2019 versions of the Subaru Forester, Toyota RAV4, and maybe the Ford Escape to go along with challenges already mounted by the all-new 2017 CR-V and 2018 Volkswagen Tiguan. Even the next-generation 2019 Hyundai Santa Fe Sport, technically a midsizer, could pose a threat. Indeed, it’s a brutally competitive segment, making the on-target resizing of the redesigned Equinox all the more essential.